Methane is one of the most potent greenhouse gases in our atmosphere and the concentrations continue to rise with human influence, making it a major contributor to human-caused climate change. Sources of methane include human related activities (anthropogenic) such as fossil fuel burning for transportation and energy generation. 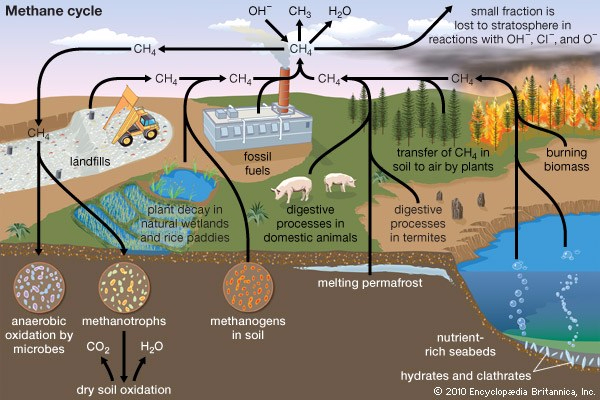 In addition, there are natural sources of methane such as wetlands, oceans, and forest fires. This research seeks to better understand methane emissions in the Arctic, and create a more accurate model of the methane quantities in the polar region. 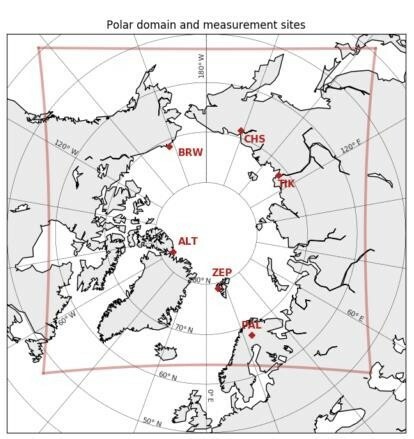 In this study, the researchers utilized continuous measurements of methane concentrations in the atmosphere over the span of a year at six sites, which can be seen in Figure 1. By obtaining continuous measurements, the researchers are able to observe changes in methane amounts throughout all seasons. The variety of sites chosen in this study allowed for measurements of background natural methane emissions as well as those influenced by major urban areas such as Alaska, Europe, and Siberia. Figure 1: Map of the measurement sites where each site is shown with a point. The red box indicates the region that was included in the model. In combination with measurements, the researchers sought to develop and improve models that work to predict emissions. This is important for better understanding and predicting what future climates may look like, as many of the natural processes in soil, lakes, and oceans that emit methane could speed up in a warmer climate. The chemical transport model used here was called CHIMERE, and breaks the region up into a latitudinal/longitudinal grid pattern with horizontal layers that has 35 km grid boxes. The authors are able to input the meteorological conditions of wind, temperature, and water vapor, the emissions scenarios, transport, and oxidation of methane which is the main removal process. They determine what source emitted methane in the model by using seven tracers that correspond to emissions from anthropogenic sources, biomass burning, the East Siberian Arctic Shelf, geology/oceans, wetlands, and freshwater systems. 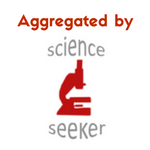 These tracers are compounds that are emitted by each source and allow researchers to correlate quantities of methane with a particular source. Using this process of combining measurements and modelling, the researchers are able to gain a better understanding of transport and emissions of methane. The dominant production of methane in the winter is from anthropogenic sources and in the summer, is from wetlands followed by freshwater systems. The researchers found that the current models severely underestimate the amount of methane emitted from wetlands and other freshwater sources. In some cases, over land, wetlands emit 45-75% more than anthropogenic sources. The large contribution from wetlands throughout the Arctic region can be seen in Figure 2. The other significant difference they observed from current models, was that the peak of methane emissions was in August-September rather than June-July as previously thought due to longer daylight hours. They found that their model was more accurate when they included these differences. Overall, the model and observations had good agreement, and they were able to successfully model bursts in emissions and the time scale over which the concentrations vary. Figure 2: Percentage contribution of anthropogenic and wetland emissions to modeled CH4 abundance during the summer months. This research discovered the importance of wetland and freshwater emissions in the summer and the difference in the peak summer emission period, pushing this event more towards the fall than previous studies had found. However, no model is perfect and one main shortcoming of this one is that it may underestimate emissions since it doesn’t account for the burst of methane that may come from lakes when they first thaw in the spring. Additionally, it doesn’t account for the transport of methane coming from outside of the polar region and each of the individual destruction processes of methane that occurs, which could be improved with a better understanding of global methane quantities. As more measurements are taken of these sources, hopefully models can be further adjusted to more accurately describe the processes that occur on Earth. With a better picture of the processes currently occurring through additional measurements, scientists can model how different future climate scenarios will change with different human and natural emissions. I'm a graduate student in physical chemistry at UC Berkeley, and did my undergraduate at the University of Washington in Seattle. My research looks at reactions that happen in the atmosphere, especially those that contribute to climate change and the depletion of the ozone layer. In my free time I love to rock climb, hike, camp, ski, and explore the Bay Area!